Rachel Von | The Journal Gazette Saint Francis football coach Kevin Donley notched his 319th victory Saturday, tied for eighth on the all-time wins list. Famous college football coaching names scroll by as the Saint Francis scoreboard displays an electronic listing of the greatest winners of all time. Soon enough, “Kevin Donley” appears on the screen. This seems fitting, considering it's at Kevin Donley Field in Bishop D'Arcy Stadium. Donley's legend continues to grow. Donley recorded his 319th career win when Saint Francis beat St. Ambrose 60-14 on Saturday, tying Pop Warner for eighth on the all-time coaching win list, regardless of competition level. Donley can pass Warner when NAIA No. 1 Saint Francis plays at Saint Xavier in Chicago this Saturday. Next up on the list for Donley to catch: Alabama great Bear Bryant with 323 wins. Donley, 67, sits at the peak of his career. His Cougars have won back-to-back NAIA titles and hold a 26-game winning streak. Saint Francis possesses the skill, experience and, obviously, the coaching to make a run at a third-straight NAIA title. Donley created the Saint Francis program from scratch, going 2-8 in the inaugural 1998 season, and hasn't had a losing season since. Donley has 41 more career wins than the next active coach, Benedictine College's Larry Wilcox. The cultural landscape has changed significantly since Donley's first head coaching job at his alma mater, Anderson, in 1978, which was long before the advent of smartphones and social media. It has changed since he won his first national title in NAIA Division II at Georgetown (Ky.) in 1991. Donley's willingness to change, too, has been critical to his success. Donley still loves the game-day competition, he emphasized, but the bigger picture of molding young men sits at the forefront of his approach. “If it was just about Saturdays, if it was just about wins and losses, I might be fishing today,” he said. The enjoyment of molding a team has not waned for the Springfield, Ohio, native. “Young coaches, even young coaches in their 40s, are all about wins and losses on Saturday,” Donley said. “The longer I go, it's all about the players. I'm more focused on their personal development, not just the football development. “My job as a head coach is to coach coaches and establish relationships with the players to develop a trust that I can guide them to make wise choices in their lives,” he said. Harnish is a four-year starter out of Norwell and within 10 tackles of breaking Brian Kurtz's Saint Francis career record. He can still remember Donley making a recruiting visit to Norwell and being immediately impressed. Offensive coordinator Patrick Donley has been on his father's coaching staff the past 15 years, and he still marvels at the way he always seems to make the right moves. Kevin Donley grants great latitude and extends trust to his bevy of long-time assistant coaches while keeping his finger on the pulse of it all. 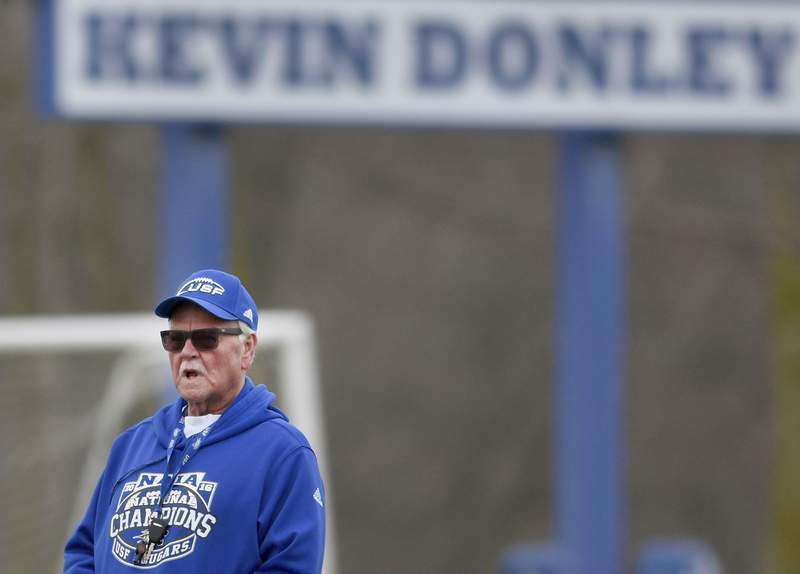 Kevin Donley's career-long drive to learn about coaching, teaching and directing college athletes surely played a huge role in his success. There aren't many successful coaches during Donley's time in the game that he didn't talk with or study. Among those ahead of him on the all-time wins list, he's spent time with Eddie Robinson and Bobby Bowden. He reminisces with delight about the three days in 1983 he spent with Ohio State coaching legend Woody Hayes. Hayes wrote a book, “You Win with People!” and Donley adheres wholly to the concept. Donley recharged his players and staff following a 6-5 season in 2014, challenging all of them to be rededicated to making the most of every day, every practice and every game. Saint Francis' record since that season is 41-2. That was the first of many times Harnish has soaked in Donley's wisdom. Donley has written a soon-to-be-released book of his own, “Snap to Whistle,” containing insight to his approach to coaching and how to be successful. The top 5 coaches on the all-time win list are Saint John's of Minnesota's John Gagliardi (489 wins), Penn State's Paterno (409), Grambling's Robinson (408), Florida State's Bowden (377) and Carson-Newman's Ken Sparks (338). It's possible Kevin Donley could reach the top 5 next season. He has no plans to retire. It's not a job for Donley. It's his life, a lifetime football journey that's put him permanently among the coaching giants.